As a family, we try to spend as much time outside as we can and it’s hard to ignore all that’s around us. The children respect nature and they understand that everything has a job in the big picture, even if it’s just as nourishment for another creature. They often challenge me to identify each organism’s job. Maybe one day they’ll catch me out. In the meantime, here are se7en+1 of our favorite ways to increase our appreciation of nature. Inspiration. We love to make things using natural materials. Half the fun is collecting the bits and pieces to use. 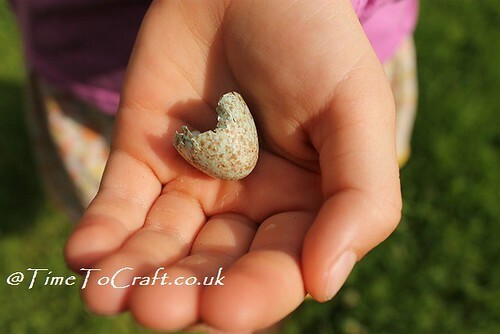 Often the project isn’t born until the moment that a newly found stone or twig is in our hands. Wonder. There is nothing like appreciating nature through drawing, photography or making a model. It’s taking the time to notice even the smallest detail. Like watching a ladybird larvae eat an aphid or studying the centre of a flower.. Discovery. Nature walks and collecting a few bits to take home for the nature table and crafting projects. Sometimes I wish I could capture and bottle the excitement of the children when they find something new! Knowledge. Books. Oh where do I start with this one? We have a huge collection of reference and story books. Also websites, such as iSpot, which we use regularly to identify insects and plants which we’ve found. Not forgetting some wonderful natural history museums we visit. Team work. Collecting data for larger projects, like the UK Bird Watch every year. Knowing that the data we have collected is adding into something even bigger. Helping. We’ve set up several areas in our garden to encourage nature. There are meadow areas to provide food for the bees and grass piles to encourage snakes and slow worms. We try to consider the impact our gardening has on the rest of the garden’s fauna and flora. Absorbing. We enjoy TV nature programs. The BBC have so many wonderful programs and nearby Bristol is home to their natural history team. Organizations. We belong to and get involved with several wild life organizations, such as the RSPB and Woodland Trust. Fabulous websites too, full of activities for the children to do. Thank- you so much Time to Craft for your list and for joining our Celebrity Fun!!! Hope you all enjoy the Olympics!!! I love Time to Craft! Hi there, All Things Beautiful!!! ISn’t Time to Craft fabulous… I could wander about their countryside forever!!! Add in their craftiness and it is a recipe for loveliness!!! Hope you have a great week!! !